Over the last few months the choir has set the goal of singing our repertoire from memory. To be a little more precise, the choir members rely solely on the musical director should their memories fail them. At first there was quite a degree of resistance, but with several concerts behind us, confidence is growing. We can certainly see the improvement that comes from having our eyes on the conductor. Also, with our heads up, our sound has become richer. One of our songs is "Without Music", which is rather ironic. Sometimes, when we sing without music, we think we know our parts well enough, only to discover that we stray from the exact notes as written. What we sing might fit and sound OK, but it is still wrong. The challenge is to return to the music and re-discover the correct notes. Many of our songs require much page turning during the learning stage, for as long as we need the music. An interim stage to memorising everything is to have the whole piece, words only, on one sheet of A4. This is even colour coded to show who sings what. Ultimately, we just have to spend time learning everything. This leads to the strong possibility of a plateau in performance, borne out of a degree of familiarity. 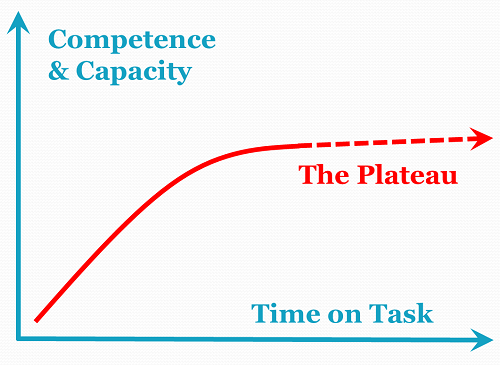 Every performer or team hits a plateau in performance. It is important that we press on and not become discouraged, bored, falsely content or complacent. The key is self belief that we are capable on the one hand and willing on the other. Let's give it our best shot, keep working and see a break through to even better performance. In my previous choir, we learnt new songs, and performed with no words or music. Much better for all the reasons mentioned above. One way of capturing your part, is to record it. Most phones have this capability, or small recorders can be used. As a newbie, i have found this really helps cement my learning of the part. Thanks Alan, lets use the plateau as a stepping stone to the pinnacle. Reach for the sky!